Here at PR News, media relations is a daily focus. It's not just one of the key beats that we report on and program events around—our media relations content also provides an opportunity for the rare conversation between editorial and comms, two different sides of the same media coin. Media Relations is also one of the few subjects that prompts communicators to listen to advice from the very reporters they're pitching. That's why we host our annual Media Relations Conference in D.C. every December. Here are some of the key takeaways from last month's show at the historic National Press Club. Most, if not all, PR pros have had some past experience as a journalist. When sending out pitches, recalling what caused you to open emails, and what caused you to scroll right past others, is a good thing to keep in mind while developing your media relations strategy. Structure your press release like a hard news story in the 'inverted pyramid' style—the most important information, names and dates at the top, with less pressing but still relevant information further down. You'll want to hyperlink to any attachments or superlative materials in the pitch, but don't attach them as documents and *don't* copy that information into the body of your email. Read the reporters you are pitching, too—going back and looking at their clips from the past year will give you a window into what they specialize on within their beats. They may not cover personnel changes or new product announcements, and if you pitch those anyway, they will know you don't really follow them closely. In moments when you need to communicate to media quickly, a press release isn't always the best move. Complicated issues around your industry don't benefit from wordy explainers in general interest publications, and educating a general interest reporter on them can only slow down your outreach further. Instead, target trade reporters who already know your industry. Not only will they have a style for communicating the complicated background context of your announcement, but they can diffuse potential crises or pain points by acting as a de-facto 'expert source' for your business/industry. There's still much talk over whether or not the press release is 'dead'—while many businesses rely heavily on them to push out new announcements, others have harnessed a social or PESO strategy that works around the traditional release to be more immediate, wide-reaching and effective. Wherever you stand, all can agree that there's no better way to get your organization's perspective out there than having a vocal influencer or brand advocate in your court. 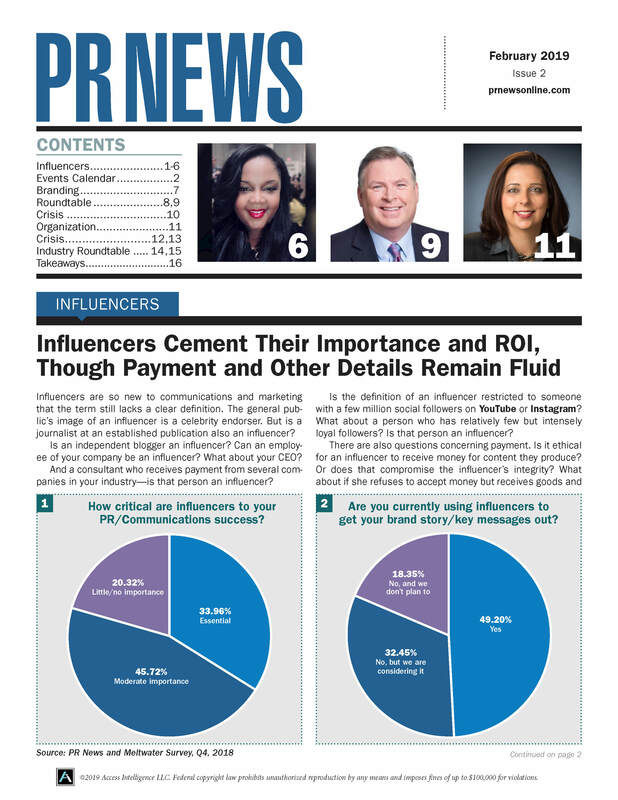 We know that PR is all about building relationships, but that should extend to media and influencers beyond a superficial, quid pro quo exchange of favors. Getting to know someone with a platform connects your relationship to the work you do, and by extension, your brand. Don't be afraid to get close to someone with a platform and an opinion. "When organizations make the mistake of considering communications as a 'nice to have' instead of a 'must have' is when you see things start to go really awry," said Kaelan Hollon, VP of Communications at the Motion Picture Association of America. "Whenever communications is your afterthought, your entire brand narrative is an afterthought, too." Instead, she stresses that communications must be consistent with how your company reacts and its values. "And it’s not just issuing press releases," she added, " it’s considering what your digital channel strategy is. Let’s say, for instance, there’s an issue with a product and you have a Twitter channel that you only update once every two weeks with middling to poor content. Suddenly, when you may need to issue something proactively, the whole brand narrative looks off. You’ve not been consistently communicating a brand narrative through that channel, and now you need to say something publicly." "Think about relevance as a driver of reputation," said Alan Chumley, managing director of communications analytics at W2O Group. Reputation matters because it drives shareholder values, but traditional definitions and offline measurement approaches (used on their own) are showing their age. Relevance defines the intersection of what companies need to say, want to say and are saying online with what stakeholders want from the companies and are saying about them online. Relevance largely refers to mindshare, or share of attention, around what is timely and topical, interesting, genuine, bold or provocative, disruptive, or which stands out from the rest of media. One big hack for measuring relevance is to focus on your CEO—find out what their goals around relevance are and measure your MR strategy against that. Bill Phelps, VP of external communications at Lockheed Martin, stressed how integral crafting audience personas is to any truly effective PESO strategy. He also explained that audience personas don’t need to come exclusively through fictional characters. In the case of his brand, they actually first came through a writer. Crowdsourcing prospective employee personas proved to be a good way to start this process, as it allowed readers to see what strong purpose Lockheed Martin employees have. “If a future engineer wants to use his or her talents to take on big challenges,” said Phelps, “such as putting people on Mars or advancing artificial intelligence,” their ambition might then make for a rich story about how Lockheed Martin is the perfect place for them to realize those goals. Amanda Miller, director of corporate communications at PayPal, learned that personal finance data is best shared with stakeholders not through verbose press releases or analyses, but visuals. And by focusing on visuals, PayPal also learned that not all data insights deserved to be illustrated. "We learned to just share fewer," said Miller. "Just because we have all this data and information doesn't mean we have to use it all." "Part of the opportunity of being in the public communications function is being able to look at everything and say, 'What is the most compelling data? What do I think will help our reporters tell a story about what's happening, then package it up and ship it over?'" By focusing on specific data points, PayPal learned not only to not overload the journalists they work with, but to ensure that those journalists will apply the data insights to tell the story that PayPal is trying to tell.